As I write this post, I'm currently doing one of those face masks that is a sheet with holes for the eyes, nose, and mouth for the first time. It's an interesting experience to say the least - it has a nice rose scent but mainly just feels like piece of slime is sliding slowly down my face and I keep needing to lift it back up and readjust. I guess this is the price one must pay for the hopes of having super moisturized skin after spending five days in the sun in Cape Cod. Every time I go to Cape Cod I forget how much I love it. From visiting Provincetown and Chatham, to eating fresh oysters and grilled flounder, discovering new old school seafood places on docks, and just lounging around on the beach, it is the ideal place to be during summer. It was nice to spend a long weekend with my family and living on beach time. Returning to work tomorrow is going to be tough. If you follow me on Instagram, you probably know how excited I have been about my new(ish) ice cream maker. I've already used it a bunch this summer and have a running list of flavor combinations I want to try over the next couple of months, but I was very proud of my first ever ice cream using egg yolks!! I needed to follow an exact recipe since it was the first time and I didn't want to mess anything up, so I went straight to Yossy Arefi's cookbook, Sweeter Off the Vine. 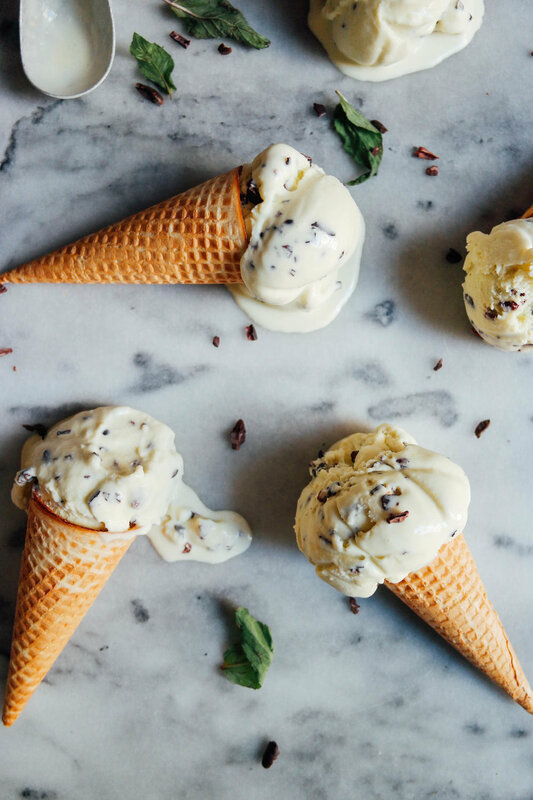 This recipe for Mint Ice Cream with Cacao Nibs is so dreamy and perfectly sweet, with the flavor of fresh mint bursting through. Combine the cream, milk, sugar, and salt in a medium saucepan. Heat over medium heat, stirring occasionally, until the mixture begins to bubble around the edges (about 5 min). Ladle 1 cup of the cream mixture into the egg yolks and whisk quickly to temper. Pour egg and cream mixture back into pot and whisk well. Cook mixture on medium low heat and stir constantly with a rubber spatula - be careful not to let it boil - until mixture thickens enough to coat back of a metal spoon (about 7 min). Remove from heat and whisk in creme fraiche, and then the mint leaves. Let mixture cool to room temp. and then cover and refrigerate overnight. Before churning, strain mixture through a fine mesh sieve and press gently on mint leaves to extract all of liquid. Churn in an ice cream maker according to maker's instructions. In the last minute of the churn, add in the cacao nibs. Transfer the ice cream into a freezer safe container and freeze until firm - about 4 hours.